Put all the ingredients except for the blueberries into a bowl and blend together with a hand stick blender. Once blended add the blueberries to the pancake mixture and stir in by hand. Spray your pancake or non stick frying pan with the oil and heat over a medium heat. Once you’ve cooked all 9 pancakes, stack them back on top of each other in a set of 3 to warm through in the hot pan and flip over to warm the other side. 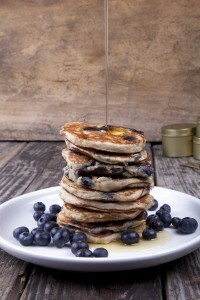 Serve warm with a drizzle of cashew butter, blueberries and syrup/honey. LISA’S TIP – After you have poured in the pancake mixture, shake the pan gentle to ensure the mixture is evenly spread. It’s hard to believe that you don’t need flour, milk or refined sugar to create a lovely, light and kid-approved pancake. Although delightful, don’t be expecting your run-of-the-mill carb-filled pancake. These have more of an eggy crepe-like texture, which is equally appealing. If you’re used to eating clean healthy foods, you will more than likely LOVE these. Low-calorie, high-protein, gluten-free and wheat-free…. what’s not to love?